Gabrielle Dunlevy, AAP Southeast Asia Correspondent, reports on the charity part of Phuket life after the 2004 Tsunami. To read the entire article click head over to news.com.au. In this month’s edition of The Magazine in the Bangkok Post an article on the Tsunami anniversary. The Foundation was mentioned as one of the positive repercussions of this catastrophe. Phuket Has Been Good To Us was featured in the newest issue of Wanderlust: Expat Life & Style Magazine – Thailand! The magazine featured an article about giving back to Phuket, and included PHBGTU in the list together with The Good Shepherd Phuket, Soi Dog and The Gibbon Rehabilitation Project. Head over to Wanderlust Magazine to read the entire magazine. Read the entire article on the website of Phuket News here. For full media coverage of the event, visit the Muay Thai Black Tie Event's page. The Phuket Has Been Good To Us Foundation was featured in the 95th issue of Phuket Francophone Magazine with a full page spread. For more information on this magazine, visit their website. "Golfers Graham Haslam and Mark Cameron are preparing to set a world record by driving an electric golf cart from Pattaya to Phuket to raise funds for local children’s education charity Phuket Has Been Good To Us." For the full article on Phuket Gazette, click here. "Phuket Has Been Good To Us held another charity event. This time at the beautiful Trisara. The main event was the opera singers from Bangkok, Fivera." For full media coverage of the event, visit our 2014 Events Page. Baan Kalim School and local charity, Phuket Has Been Good To Us, were recently recognised by the Thai Ministry for excellence in teaching. 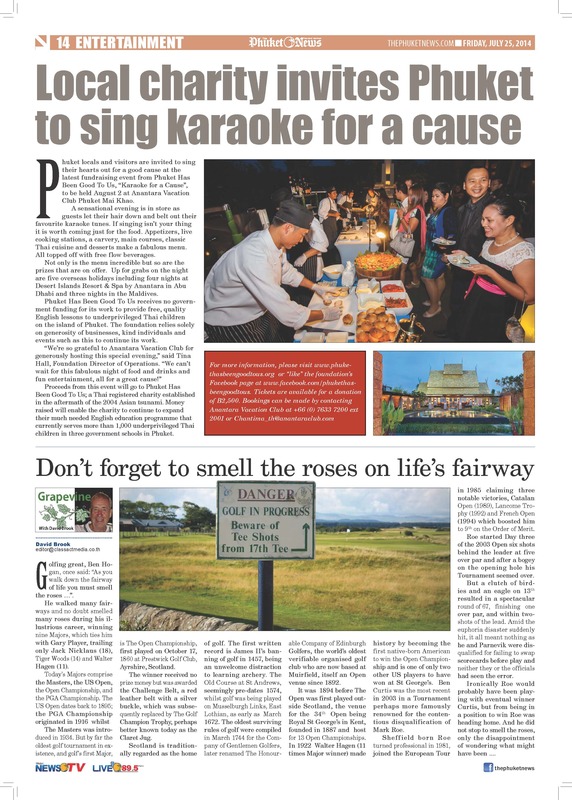 "Phuket locals and visitors are invited to sing their heart out for a good cause at the latest fundraising event from Phuket Has Been Good To Us, "Karaoke for a Cause", to be held August 2 at Anantara Vacation Club Phuket Mai Khao." For the full article from Phuket News, click here. For full media coverage of the event, please visit our 2014 Events Page. "Mövenpick Resort & Spa Karon Beach Phuket team invited 20 underprivileged children from The Phuket Has Been Good To Us Foundation to visit the resort for fun activities on Saturday, May 31." Click here to see the feature on Phuket News Island Scene. "Local charity Phuket Has Been Good To Us recently raised the benchmark for events on the island, with a Miami Beach Party fundraiser on May 9." "A Masquerade Party, a fundraiser for the Phuket Has Been Good To Us Foundation, was held at the Pullman Phuket Arcadia on February 8." For more news, pictures and media coverage on the event, check out the 2014 Events Page.